The suburban dream of a single-family house with a white picket fence no longer describes how most North Americans want to live. The dynamics that powered sprawl have all but disappeared. Instead, new forces are transforming real estate markets, reinforced by new ideas of what constitutes healthy and environmentally responsible living. Investment has flooded back to cities because dense, walkable, mixed-use urban environments offer choices that support diverse dreams. Auto-oriented, single-use suburbs have a hard time competing. Suburban Remix brings together experts in planning, urban design, real estate development, and urban policy to demonstrate how suburbs can use growing demand for urban living to renew their appeal as places to live, work, play, and invest. The case studies and analyses show how compact new urban places are already being created in suburbs to produce health, economic, and environmental benefits, and contribute to solving a growing equity crisis. Above all, Suburban Remix shows that suburbs can evolve and thrive by investing in the methods and approaches used successfully in cities. Whether next-generation suburbs grow from historic village centers (Dublin, Ohio) or emerge de novo in communities with no historic center (Tysons, Virginia), the stage is set for a new chapter of development—suburbs whose proudest feature is not a new mall but a more human-scale feel and form. David Dixon, FAIA, leads planning and urban design for Stantec's Urban Places, an interdisciplinary team that helps cities and suburbs alike thrive by harnessing the growing demand for urban life. "Key places within the suburbs are transforming, and Suburban Remix makes a strong case that suburban retrofit is a powerful force in the American landscape—backed by local political will and significant capital....Suburban Remix updates the story in a way that will be easy for nonprofessional public officials in suburban cities and towns to understand." "The case studies...include different-sized areas and different stages of the urbanizing process...Walkability books often pretend that all places have equable Mediterranean climates; in this book, however, Dixon's chapter on planning offers advice for both winter and summer cities." "Interspersed throughout a compendium of articles by some 16 contributing authors are facts, observations, and speculations that, on occasion, are eye-opening, jarring, and truly worthy of regard and concern...Individuals who have a new found interest in urbanism and the plight of the contemporary city and suburb will find Suburban Remix a useful read and good tool for recall and reference. It was delightful to see the topic presented in such a thoughtful and accessible way." "Makes a compelling case for transforming the country's aging suburban population centers into dense, walkable communities...Suburban Remix represents a valuable resource for policymakers, planners, and designers engaged in large-scale re-imagining of what a suburb can be." 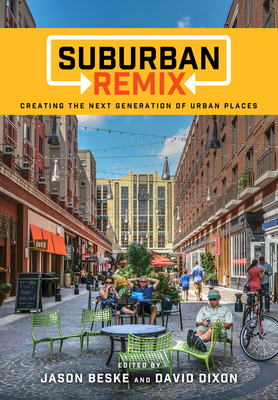 "Suburban Remix brings together leading experts to describe the dramatic market shifts away from drivable sub-urban development patterns toward walkable urban places, while its detailed redevelopment case studies provide priceless lessons in planning and implementation. Planners, developers, and citizen activists eager to position their suburbs for the next generation will deem this a precious resource." — Ellen Dunham-Jones, Professor, Georgia Institute of Technology and coauthor of "Retrofitting Suburbia"
"In North America, most of our land and our people remain suburban, and their future is our future. Happily, the same principles and techniques that have been re-humanizing our city centers are now at work on sprawl, with some remarkable results. The suburban remix is on, and this wise and useful book tells how you can bring it home to your community." — Jeff Speck, City Planner and author of "Walkable City"
"Beske, Dixon, and the contributors to Suburban Remix have beautifully mapped a clear, inclusive, and exciting way forward for us all." — Mike Lydon, Principal, Street Plans and coauthor of "Tactical Urbanism"
"Dixon and Beske have put together a real-world guide to introducing walkable development in suburbs. I recommend Suburban Remix to anyone who lives, works, or invests in a suburb. It shows how lively, walkable urban places can thrive in suburbs. More to the point, it argues that suburbs no longer can thrive without walkable urban places." — Kaid Benfield, Senior Counsel, PlaceMakers, LLC and author of "People Habitat"